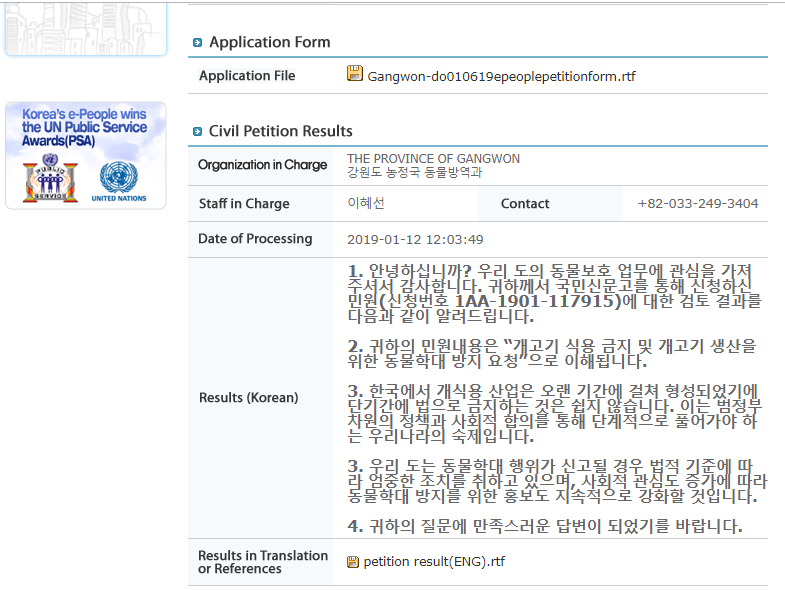 Below is Gangwon-do Province’s response to our petition: Gangwon-do, South Korea, Shut down the illegal dog meat farms, slaughterhouses and markets. 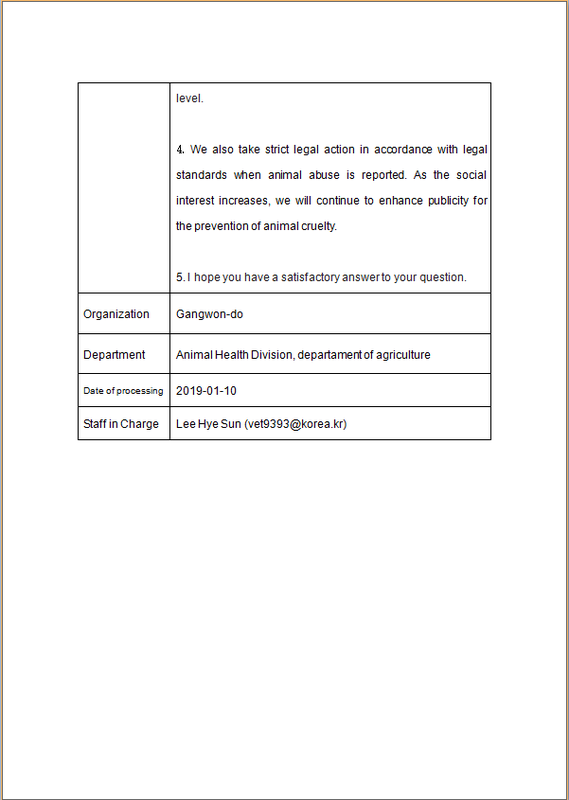 Gangwon-have failed to address our concerns relating to their failure to enforce existing laws that make the dog meat trade illegal. 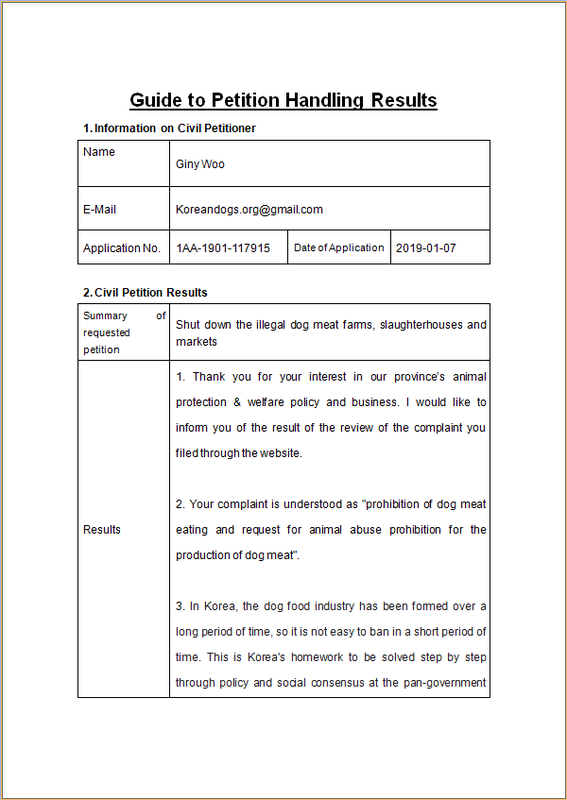 We do not understand their response that “In Korea, the dog food industry has been formed over a long period of time, so it is not easy to ban in a short period of time.” It’s 2019! How much longer does country need to bring their animal welfare standards up to the very basic level that is present in other countries that are even well less developed than they are?! This is the nation of technological innovation through companies such as Samsung, Hyundai, Kia and LG and it is committing medieval, horrific acts of animal abuse, neglect, cruelty and slaughter, through a trade centered around the consumption of animals known as our best friends and companions. Dogs are part of the family in South Korea, as they are in other countries. They play a vital supporting role in people’s lives, whether that is simply as a best friend or indeed through active service via the military or police, or as eyes for our blind people, or indeed as supporting carers for our sick and disabled people; enabling them to live fuller lives in the community. To many they are treated as children would be, as part of the family. Gangwon state that “This is Korea’s homework to be solved step by step through policy and social consensus at the pan-government level.” How long must we wait and suffer in anguish until South Korea does its “homework”?